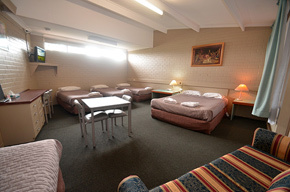 Motel in Parkes NSW has 39 ground floor rooms and is a AAA 3½ star rated motel on the Newell Highway A39. Free WIFI, Foxtel, Restaurant, swimming pool, BBQ area and guest laundry. Winner of Trip Advisor's certificate of excellence 2014, the Parkview Motor Inn has deluxe rooms, Standard Rooms, and Family Rooms for up to 6 guests, a 2 bedroom unit, interconnecting rooms and disabled rooms. Our Facilities include: Swimming Pool, Licensed Bar and Restaurant (open Mon – Sat 6pm – 8.30pm ), Guest Laundry, BBQ facility and parking at your door. The Parking is exceptional at the Parkview we can cater for your Trailers, Caravans, and Motor homes, Boats, Coaches, Minibuses, Vans and Trucks. 1 Queen bed and 1 single. The Unit has free WiFi, tea coffee making facilities, fridge, toaster, iron, ironing board, reverse cycle air-conditioning, electric blankets, TV with foxtel and hairdryer. A roller away bed can be added for additional person. Rate is for 3 people. Sleeps up to 6 people in one room. This room consists of 1 Queen Bed and 4 Single Beds. The Unit has free WiFi, tea coffee making facilities, fridge, toaster, iron, ironing board, electric blankets, TV with foxtel (Premiere movie channel) and hairdryer. Rate is for 6 people. Local attactions include the Telescope , better known as the "dish" and the Castle (Elvis) Museum. We are right next door to Parkes’ Hockey and Touch Football Fields and Netball Courts. 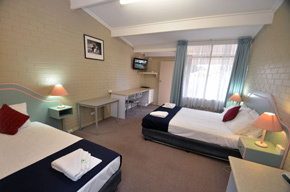 We look forward to welcoming you to Parkes and hope you will come and stay with us.